Past Scholarship Holders – where are they now? The Makana Choir School was initiated in June 2009 by the then Director of Music at the Cathedral, Barbara Stout, and her husband Wilf, who was the Cathedral organist. They began with a handful of junior choristers, all Junior School pupils, and by the end of that year they numbered 15. In July 2012 Mrs Stout was succeeded by Dr Andrew-John Bethke, who held the position of Director for five years. Under his direction the level of professional musical training was maintained, and indeed exceeded the high standards previously set. Since his departure in April 2017 the choir has been trained and conducted by the Choir Intern, Kutlwano Kepadisa, known as Kepa. He also founded and conducts a community choir, Makhanda Kwantu Choir, that recently participated in the World Choir Games. A few of the Makana Choir School choristers participated in this prestigious competition, at which the choir received a Silver award. Many of the young choristers, who have joined the choir while in primary school, stay on until Grade 11 or Matric. Several of the older boys now sing tenor and bass parts. As older choristers leave, other youngsters are auditioned and recruited to take their place. The junior choristers attend local state schools: Graeme College, Victoria Girls’ High School, Victoria Primary and Mary Waters High School. The choristers are trained in singing and musicianship during a one-and-a-half hour practice at the Cathedral each week, and a one-hour practice before every choral service. They take part in two Choral Evensong services and two choral morning services per month, always with a different repertoire. In return for the choristers’ commitment to the Choir they may be eligible to receive a Scholarship towards their school fees (a means test applies). In 2018 the full scholarship amounted to R4,500 per annum, paid directly into the choristers’ school fee account in two half-yearly tranches. Probationers who are only admitted as full members of the choir half-way through the year receive a half scholarship in the second half of the year. Belonging to the Cathedral Choir exposes the young people to singing an extensive repertoire at a professional level. The Choir is becoming better known through concerts, and through singing during the National Arts Festival. Listen to the Cathedral Choir singing part of ‘Ubi Caritas’ by Ola Gjeilo in October 2018. Makana Choir School was featured in an episode of the religious programme Slice of Light, which was broadcast on SABC2, on Sunday 5 August. This included short interviews with choir conductor Kutlwano Kepadisa, and two of the junior choir boys, Xolisa Foley and Junaid Douglas. The programme can be downloaded from YouTube. The Vision of the Choir School is to develop the musicianship of young choristers and thereby to develop them as well-rounded leaders in their community. 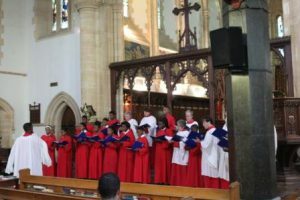 To provide educational enrichment, academic support and supplementary tuition in the areas of vocal training, general musicianship, and training in sight-reading and choral technique to a high standard, in the context of the Choir of the Cathedral of St Michael & St George, Grahamstown (Makhanda). to respect and honour the historical and cultural background of choral music and recognise its importance in worship. Scholarships are paid towards the Choristers’ school fees, and are deposited directly into their respective school fee accounts in liaison with the school bursars. Musical: Choristers are selected based on an initial and follow-up audition. At the beginning of each year potential choristers have an initial audition. If accepted as Probationers they then serve a probationary period of some months without scholarship. At the end of this period the probationer takes another audition to become a full chorister. Academic: To be awarded/re-awarded a scholarship a chorister must generally have passed their last school grade. Scholarship choristers’ reports are obtained from schools so that their academic progress can be reported to funders and used as a basis for the Scholarship award/re-award decision. Choristers not eligible for a scholarship because of poor academic performance (i.e. not being promoted to the next grade) will not be eligible for a scholarship but they will, however, not be excluded from the choir. Attendance: Choristers are expected to attend at least 80% of all practices and services punctually. An attendance register is used to record attendance and will be scrutinised in deciding on the award/re-award of scholarships. Financial Need: Scholars with a Household Income of less than R320,000 p.a., and who meet all the above-mentioned criteria, are considered for a Scholarship. New probationers are accepted at the beginning of the academic year on the basis of an initial audition and serve their probation before being auditioned as full choristers and being able to apply for possible inclusion in the scholarship scheme. Any child who applies to join the choir at mid-year might be allowed to do so if successful in their initial audition, but will remain a probationer and not be eligible for a scholarship until the following year. If at the beginning of the next year a child who has already been in the choir for at least three months, is competent and passes the full chorister’s audition, he/she may be admitted as a full chorister and receive a scholarship right away. All scholarships will be re-awarded annually based on a musical re-assessment at the end of the year and provided they are still complying with all other scholarship criteria. The scholarships will be paid in two tranches. In their first year, new choristers who have passed their full choristers’ audition at the end of their probation period will receive the second tranche of the scholarship only, at the beginning of the 3rd term. A few of the old choristers share their different journeys in the choir and what they have been doing since their departure. They were interviewed by another past chorister, Aphiwe Mame, a Journalism graduate presently working as a Programming Assistant for Rhodes Music Radio. Anelisa Kelemi, 22, who joined the choir in 2009, currently studying for her BA, triple majoring in Psychology, Sociology and Instrumental Music Studies at Rhodes University, shares how her choir experience helped her build a symbiotic relationship between her Music major and the rest of her modules. How did your choir involvement aid in choosing your degree? My choir involvement helped me to choose the degree that I have chosen in that the skills that I had learnt in choir and the lessons I was learning in school somehow met and showed me that I did not have to choose between music and everything else I was good at and what was expected of me, my choir experience helped me to build a bridge between music and the rest of my modules. What would you say were your greatest musical accomplishments during your time in the choir? My greatest musical accomplishments started in my Grade 7 year in 2009 when I first joined the choir, I was 2 marks away from getting a distinction in my grade 4 RSM Voice exam and I got a Gold at my first Eisteddfod which was an amazing achievement for me. I was also “Music Captain” in my Grade 7 year and continued to excel in music throughout my schooling years. I got my half cultural colours in my grade 10 year and my full colours in matric and I also became the first Head Chorister of the Makana Choir School. In my matric year I was captain of the VG Choir and deputy leader of the VG Orchestra. I was also the only singer at my school that year to get a double gold in the Eisteddfod and to this day I am the last person to matriculate with a distinction in music at VG. If you can recall, why did you choose to be part of the Choir? Quite honestly, I chose to be part of the choir because my teacher brought Mr. and Mrs. Stout to audition me and she thought I would be a fantastic addition to the choir and for a 12-year-old when someone believes in you like that you can never let them down. I joined because it was an amazing opportunity to increase my musical education and somehow someone thought I was special enough to be part of something as amazing as a choir school. What was the most demanding thing in the choir? The most demanding thing in choir must have been the rehearsals and trying to balance school life and choir and dealing with constantly being busy while your peers aren’t so busy. What was the most beneficial thing you learned and/or experience you had while in Choir School? One of the most beneficial things that I learnt in the choir was commitment. I learnt that no matter what was going on in my life if I had made a commitment I need to stand by it. Choir also taught me to be organized and to be able to manage my time wisely, I got to a point where I could be calm in an academic storm because being busy was something choir trained me to survive. Are there any lessons that you learnt from the choir that you are currently utilizing as a student? Firstly, the discipline and skill of listening is a skill I learnt in choir that I still use today. I also learnt to follow through with things in life because there were times where I would be tired and not want to be at choir, but I would push myself because of the type of people we were being raised to become in the choir. 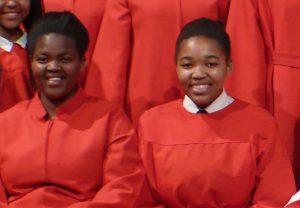 Phelela Seyisi, 21, is one of the very first choristers to join the Makana Choir School. 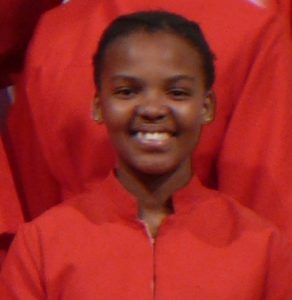 She joined the choir in 2009, she was in grade 4 at the time. I am currently in my 3rd year of studying doing a Bachelor of Arts degree in Industrial Psychology and Sociology. How did you become part of the choir? I was introduced to the choir when I was in grade 4 so that was in 2007 and I was just excited by the idea of singing in The Grahamstown Cathedral Choir School which then sounded like such a huge deal especially for a Grade 4 pupil and to top it off being handpicked was just an even bigger deal . Plus, music is such a great passion of mine. What was most challenging in the choir? The Wednesday practices and Sunday services I found those to be challenging for me. Rehearsals coupled with academics, sports, and house chores meant that one had learn how to balance their time from an early age. The services, Morning Eucharist and Evensong, made it difficult for me to attend my home church. But I was committed to the choir. Wow. I think being in the Cathedral choir was an accomplishment enough for me and being recognized as one of the founding members was such a huge attainment, but the opportunity to learn to read and understand music that I was afforded, I feel was far greater because it’s a lifetime skill. The choir offered me a chance to be an all rounder when it comes music. What piece of advice would you give have for current young choristers? To recognize and appreciate the opportunity that they have been given because I felt like being part of the choir was such a privilege and back then, not just anyone could be in the choir that’s how big of a deal it was. I just want them to enjoy the experience and be thankful for it. Responsibility, confidence and being a team player. This has got to be one of the most important things I learnt from the choir and as obvious as that may sound it is quite a difficult skill to have because sometimes you must let others take the lead and you follow which is not always the easiest things to do. Also working hard and to keep practicing something until you get it right. 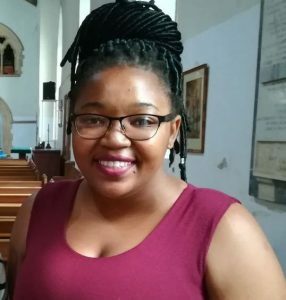 Siyasanga Santi, 23, is another founding member of the choir school, she recently graduated at Rhodes University, with a BA, majoring in Psychology and Politics and International Relations. She is currently on a sabbatical. She sings with the Makhanda Kwantu Choir. The day I received a letter as the founding member of the choir, I had no idea what it meant but it was going to contribute towards paying for my education and it was talking about music. That was the happiest moment of my life, that moment defined what music meant for me. I was an amateur when it came to reading music. The greatest musical accomplishment during my time in the choir was learning how to read music and being able to work with other choristers from diverse backgrounds. Are there any lessons that you learnt from the choir that you used during your time of study? Indeed. Valuing time and being consistent in all facets of my life. These principles have made it easy for me to tackle challenges in both my academic career and social setting. I also learnt to respect and appreciate the process. As we were being prepared to be seasoned choristers. Music is all about discipline, focus and respect. If they lack these qualities, they going to have challenges with progress. The young choristers should take this period seriously if they want to grow as choristers and if they want to have a smooth transition into other music communities. Makana Choir School was featured in an episode of the religious programme Slice of Light, which was broadcast on SABC2, on Sunday 5 August 2018. This included short interviews with choir conductor Kutlwano Kepadisa, and two of the junior choir boys, Xolisa Foley and Junaid Douglas. The programme can be downloaded from YouTube. The Makana Choir School would like to ask for your support towards this worthwhile project. On behalf of the Choristers of the Makana Choir School, thank you for your interest in this initiative focussed on the development of their musical and choral skills and in them as leaders in their respective communities. Your generous support will undoubtedly have significant impact on the Choristers and on the broader Grahamstown community. A number of individual donors make regular monthly payments to the Choir School, which although not large in themselves, together make a valuable contribution towards the Choir School’s budget. Please consider joining them. Donors are requested to give their email address as the ‘From reference’, so that gifts can be acknowledged, and they can be updated with news about the Makana Choir School. For the first two years of its existence, the Choir School was funded entirely by a private benefactor who had close links with the Cathedral. In 2011 the Oppenheimer Memorial Trust Fund added its support to the tune of R40,000 in addition to the private funding of R140,000. In 2012 Lewis Stores donated R3,000 towards the Choir School. This, along with private funding of R80,000, supported scholarships, some of which were reduced to half scholarships for 2012. In late 2012 the New Settlers Foundation committed R50,000 to the Choir School, and we are grateful that they have continued to support us with annual grants of varying amounts, dependent on the availability of funds. Their contribution for 2018 was R100,000, and they have given the same amount for 2019. Another frequent donor whose support we value is the Donaldson Trust, which from time to time contributes towards specific projects such as choir training camps. In October 2018 we were delighted to receive a donation of R5000 from the Archbishop Thabo Makgoba Development Trust. In addition to these there are a number of individuals who generously give monthly sums towards the scholarships and other expenses of the Makana Choir School. Their combined contributions are vital in enabling the work of the Choir School to continue. Wilf and Barbara Stout, Founders of Makana Choir School.